There is a certain danger in making the villain the hero/heroine of the film, a risk of making a figure known for evil too sympathetic. Maleficent purports to tell either Sleeping Beauty's nemesis' side of the story, or give us 'the real story' behind the fairy tale. While the film takes liberties with the story we all know, it has a strong atmosphere, great nods to fantasy worlds and a knowing performance by Angelina Jolie that makes Maleficent enjoyable if nothing more. As a child, Maleficent guarded the magical land that bordered the land of humans, with whom there was always tension if not downright conflict. One day, she comes across Stefan, a poor lad who yearns to rise above his station. A friendship develops, which soon turns to love. As time goes by however, the King wishes to wipe out their feared rival, but Maleficent, now a fully-grown fairy, has tremendous powers that keep them at bay. The King pledges his throne to he who can subdue this monster, and guess who happens to be serving at Court when this is announced? In the guise of warning her, Stefan and Maleficent spend a night together (rather chastely, mind you...this movie is PG). As reward for their night, Maleficent finds her wings have been hacked off while she slept heavily (thanks to the medieval version of roofies), and now, embittered and angry, she waits for her opportunity to strike back. It comes when she learns that King Stefan has a daughter who will be christened before the nation. With her loyal crow/manservant Diaval (Sam Riley), Maleficent places a curse upon Aurora: before the sun sets on her sixteenth birthday, she will prick her finger on the spindle of a spinning wheel and fall into a sleep like death. This curse is irreversible, with one caveat: it can be broken by true love's kiss. Fearing for Aurora, the King sends her off with three fairies who will raise her in hiding until the day after her sixteenth birthday. As an added precaution, he orders all spinning wheels destroyed and hidden within the deepest dungeon in the castle. Maleficent, however, will not be denied. She spends all those years with Diaval observing Aurora, and as time develops (and she protects the Princess from the fairies' ineptness), she grows to love the child. Aurora (Elle Fanning) knows all about Maleficent, but thinks of her as her fairy godmother! Maleficent does not dissuade her ideas, and Aurora tells her she wishes to live in her fairy kingdom. 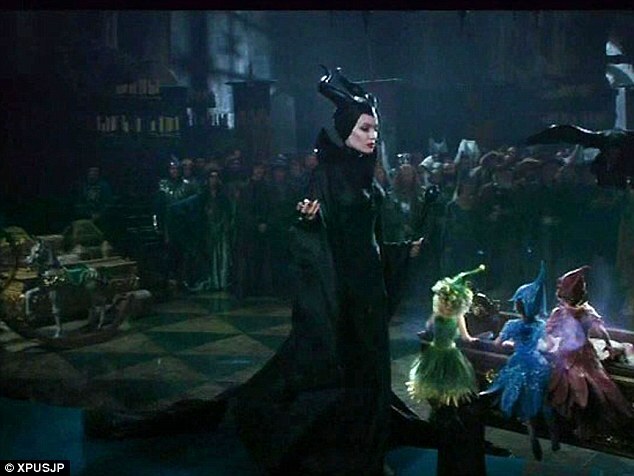 Maleficent's heart has melted and she attempts to revoke the curse, but finds she cannot. King Stefan, for his part, has grown more paranoid about Maleficent. As hard as everyone tries Aurora still falls to the prophesy. Malevolent, now totally enchanted with her ward, even tries to stop it by rushing with Prince Philip (Brenton Thwaites), but is too late. Oddly, it isn't Prince Philip's kiss that awakens Aurora (though he is certainly game for trying). Instead, it is from another, who has given Aurora true love. However, a fierce battle erupts when Maleficent is discovered, and with one or more twists Stefan is defeated and Aurora binds both kingdoms in peace. Be certain of one thing: Maleficent is Jolie's show from start to finish. Looking more glamorous than demonic (with cheekbones that are a special effect unto themselves), Jolie is shrewd enough to play Maleficent as someone who has been turned evil rather than just being evil for evil's sake without slipping into camp. I think it is because Jolie first off allows glimmers of kindness to shine through. Maleficent spending the day with her 'goddaughter' allows us to see that the 'villain' is capable of reaching the understanding that not all humans will do her as badly as Stefan did. By giving Maleficent a bit of humanity, Jolie allows us to see her as a more complex figure, almost someone not just redeemable but worthy of redemption. This does has the unfortunate effect, however, of drowning almost everyone else. Fanning has nothing more to do than smile and be pretty, totally enchanted with her 'fairy godmother'. Same goes for Thwaites as Prince Philip: he just pops in because the story needs him, then is almost immediately put into a sleep by Maleficent, spends most of his time in a state of unconsciousness, fails to wake the girl when kissing her, and pops in at the end. Even sadder is to see the three fairies reduced to comic relief (and bad ones at that) and Copley's one-note mad King Stefan. About the only one to have anything close to an arc apart from Jolie is Riley's Diaval, and I'm of two minds about him. Riley is someone that I think has it in him to be a great actor, but apart from his brilliant turn as the late Joy Division frontman Ian Curtis in Control he seems to be performing all his parts the same way: a bit cold, aloof, distant. It was the same here, but while it wasn't a terrible performance his role as Maleficent's conscience/confidant/henchman/court jester was also a bit, well, distant. This isn't to say that Maleficent is not enjoyable; far from it. Linda Woolverton's screenplay does at times not only stray from Sleeping Beauty (in the original, Maleficent cursed Aurora to die, and the third fairy's gift was that it would not be death but sleep, while Maleficent has the title character doing double duty as providing both curse AND escape) but add moments that do border on the idiotically convenient (the matter about Maleficent's wings being a prime example). Still, I imagine Robert Stromberg had a family audience in mind when directing Maleficent; along with the PG rating, we get the fairy kingdom which Maleficent rules populated with somewhat cuddly creatures who are a bit afraid of Maleficent but who are never actually harmed by them. At one point when she's with Aurora one of the creatures accidentally throws mud at Maleficent, and rather than be struck down Maleficent slyly slings mud back and I think even has a laugh about it. That is one has to keep in mind while watching Maleficent: the title character can be a bit scary but it's clear that she is not evil in the Satanic sense, merely hurt and striking out for revenge only to see in the end that love is more powerful than hate. Maleficent is a family film that is a little dark but not too intense for elementary-school children (apart from the final battle with Diaval as the dragon and King Stefan's not-too-gruesome end) and it should be seen that way (in every meaning of the term). I would advise against letting toddlers watch it and would recommend Sleeping Beauty first (animation can be easier to take than live-action), but on the whole I was entertained by Maleficent and thought it worked for what it was doing: telling another side to a well-told tale. With a show-stopping performance by Jolie and some beautiful-looking imagery, Maleficent is less revisionist take on Sleeping Beauty and more alternate take on the tale, using elements from it to spin its own story where the Devil's Handmaiden gets her due.